The ear has two sensory functions: hearing and equilibrium (balance). The sensory receptors for both of these are located in the inner ear, and each consists of hair cells with stereocilia (long microvilli) that are sensitive to mechanical stimulation. The hair cells are mechanoreceptors. Figure 9.12 shows that the ear has three divisions: outer, middle, and inner. The outer ear consists of the pinna (external flap) and the auditory canal. The opening of the auditory canal is lined with fine hairs and sweat glands. Modified sweat glands are located in the upper wall of the canal; they secrete earwax, a substance that helps guard the ear against the entrance of foreign materials, such as air pollutants. The middle ear begins at the tympanic membrane (eardrum) and ends at a bony wall containing two small openings covered by membranes. These openings are called the oval window and the round window. Three small bones are found between the tympanic membrane and the oval window. Collectively called the ossicles, individually they are the malleus (hammer), the incus (anvil), and the stapes (stirrup) because their shapes resemble these objects. The malleus adheres to the tympanic membrane, and the stapes touches the oval window. An auditory tube (eustachian tube), which extends from each middle ear to the nasopharynx, permits equalization of air pressure. Chewing gum, yawning, and swallowing in elevators and airplanes help move air through the auditory tubes upon ascent and descent. As this occurs, we often hear the ears “pop. Whereas the outer ear and the middle ear contain air, the inner ear is filled with fluid. Anatomically speaking, the inner ear has three areas: The semicircular canals and the vestibule are both concerned with equilibrium; the cochlea is concerned with hearing. The cochlea resembles the shell of a snail because it spirals. Sound waves pass through the auditory canal and middle ear to the spiral organ in the inner ear, which transforms them into nerve impulses conducted in the auditory nerve to the brain. Figure 9.12 Anatomy of the human ear. In the middle ear, the malleus (hammer), the incus (anvil), and the stapes (stirrup) amplify sound waves. In the inner ear, the mechanoreceptors for equilibrium are in the semicircular canals and the vestibule, and the mechanoreceptors for hearing are in the cochlea. Through the Auditory Canal and Middle Ear: The process of hearing begins when sound waves enter the auditory canal. Just as ripples travel across the surface of a pond, sound waves travel by the successive vibrations of molecules. Sound waves do not carry much energy, but when a large number of waves strike the tympanic membrane, it moves back and forth (vibrates) ever so slightly. 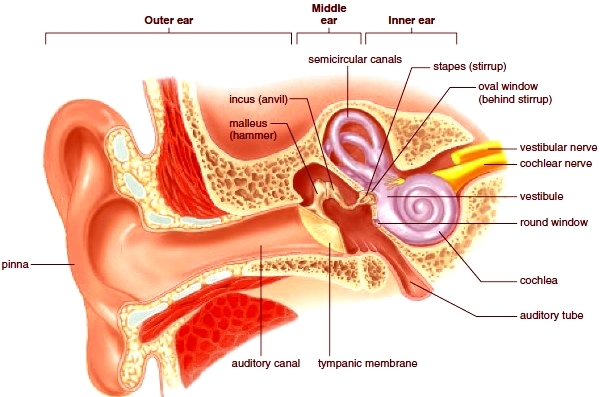 The malleus then takes the pressure from the inner surface of the tympanic membrane and passes it by means of the incus to the stapes in such a way that the pressure is multiplied about 20 times as it moves. The stapes strikes the membrane of the oval window, causing it to vibrate, and in this way, the pressure is passed to the fluid within the cochlea of the inner ear. From the Cochlea to the Auditory Cortex: If the cochlea is unwound and examined in cross section (Fig. 9.13), you can see that it has three canals: the vestibular canal, the cochlear canal, and the tympanic canal. 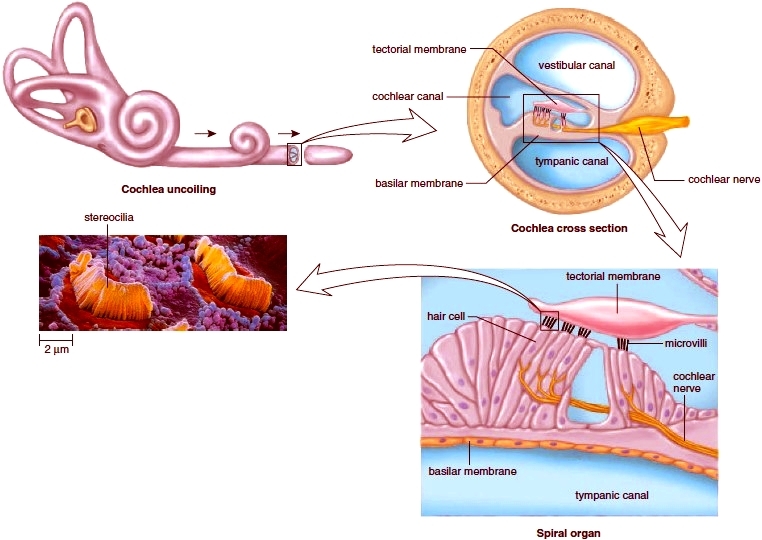 The sense organ for hearing, called the spiral organ (organ of Corti), is located in the cochlear canal. The spiral organ consists of little hair cells and a gelatinous material called the tectorial membrane. The hair cells sit on the basilar membrane and their stereocilia are embedded in the tectorial membrane. When the stapes strikes the membrane of the oval window, pressure waves move from the vestibular canal to the tympanic canal across the basilar membrane. The basilar membrane moves up and down, and the stereocilia of the hair cells embedded in the tectorial membrane bend. Then nerve impulses begin in the cochlear nerve and travel to the brain stem. When they reach the auditory cortex of the cerebral cortex, they are interpreted as a sound. Each part of the spiral organ is sensitive to different wave frequencies, or pitch. Near the tip, the spiral organ responds to low pitches, such as a tuba, and near the base, it responds to higher pitches, such as a bell or a whistle. The nerve fibers from each region along the length of the spiral organ lead to slightly different areas in the brain. The pitch sensation we experience depends upon which region of the basilar membrane vibrates and which area of the brain is stimulated. Volume is a function of the amplitude of sound waves. Loud noises cause the fluid within the vestibular canal to exert more pressure and the basilar membrane to vibrate to a greater extent. The resulting increased stimulation is interpreted by the brain as volume. It is believed that the brain interprets the tone of a sound based on the distribution of the hair cells stimulated. Figure 9.13 Mechanoreceptors for hearing. The spiral organ (organ of Corti) is located within the cochlea. In the uncoiled cochlea, note that the spiral organ consists of hair cells (resting on the basilar membrane), and the tectorial membrane above the hair cells. Pressure waves move from the vestibular canal to the tympanic canal, causing the basilar membrane to vibrate. This causes the stereocilia (of at least a portion of the more than 20,000 hair cells) embedded in the tectorial membrane to bend. Nerve impulses traveling in the cochlear nerve result in hearing.